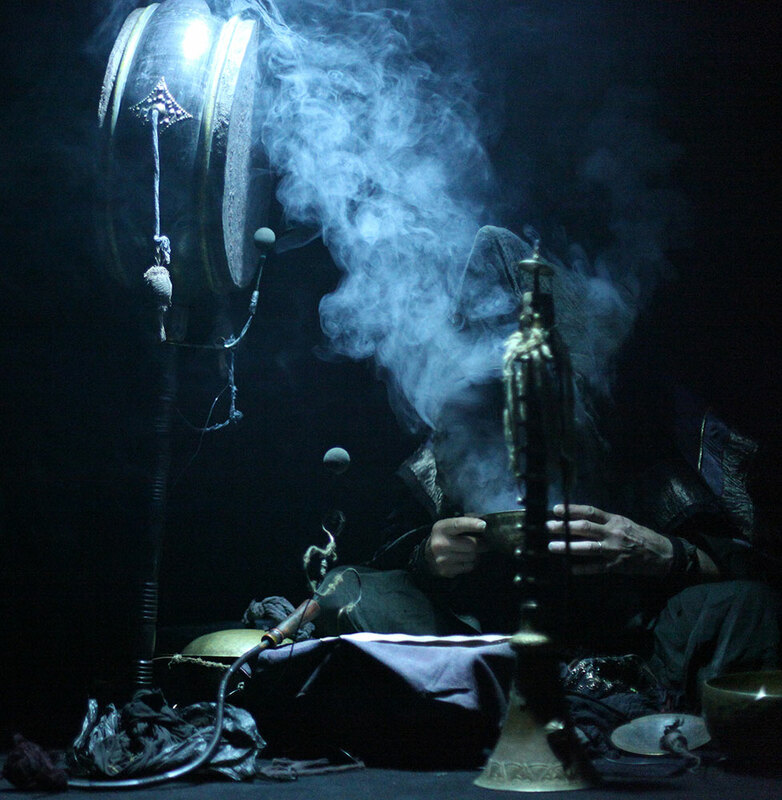 In another look at the inimitable Alexey Tegin, voice of the void and leader of Russian ceremonial ensemble Phurpa, we learn of the journey through black holes into terrifying trance and how resonating with the numinous will safeguard one’s vessel. – PHURPA for the contemporary world, we feel terroristic – crashing minds with opposite culture and inner ritual. Our performances are never alike, mantras are the same but energy and intensity is different. Afterwards I have more experience inside me, granting new depth to my voice. I always try to sound freer, wilder, deeper. As esoteric as this approach of perpetual evolution may sound, inspiration doesn’t exclusively stem from Himalayan tantrism. – When I was young I liked guitar player number one; Jimi Hendrix. Same riffs, but never played alike. For each performance he had more experience, and used it to create. Believe in yourself and do more than you can. We are universe child – don’t forget it. In our conversation last year, we thoroughly examined PHURPA’s ritualistic aspects as well as Alexey’s spiritual journey. My aim this time around was a more personal portrayal of the Russian enigma, so we start by exploring his normal everyday reality. – PHURPA is my normal day, I have no other lifestyle. When I drink, talk, breathe – it’s total. I’m no normal man, I forget normal life. In my mind, I sit in universal space and feel myself. When I eat, when I handle my instruments … in my mind; loud yet silent, I hear sounds like space. For me it’s normal. What is an average day for you at home in Moscow like? The robust 67 year-old, who is in impeccable physical shape, throws a series of punches and elbows into the unsuspecting air. – Kung fu, kickboxing. Every time, I’m killer. I have continued more than twenty years. Then voice practice. And for one hour I just sit with eyes closed, flying through another space and smelling information. It’s difficult to explain … yes, meditation! Alexey has a fifteen-year-old daughter who is currently studying to become a painter – much like her father. – We talk about space and speak of music. I am also art director at Tegin Fashion House. My wife is a designer, I direct. We create concepts for her shows – it’s interesting for me, no work for money; art. That’s my life, I’m happy. Alexey lives in a central Moscow apartment building near the Kremlin, with his art studio on the top floor. He explains that a metropolis is always designed in circles, and so its power amasses in the city centre. This is what he strives to harness in his creative output. – Moscow is like central Europe, very politically correct, very clear, very law … there’s money there now. When I was young there were lots of squats, and metal garbage to make instruments from. Now it’s only shops. For me, Moscow social situation is not interesting. I like to walk the streets at night-time, when most are asleep. I was under the impression that nocturnal strolls through Moscow could be somewhat hazardous. Alexey scoffs. – When you step into the wilderness, you say: I am king of this forest. I am the forest, and these are my animals. You transform into the leader of this space, same when talking to gangsters. Chechen guys came to me in Moscow, aggressive in the night. I looked at them. Around twenty years old – but I visualised them as school kids, maybe nine years of age. After seeing them as children, Alexey addressed them accordingly. – Beard, muscles; only attributes. Inside there is child. ’Go away!’ Three seconds stare and they leave me alone. In the night, I practice many different situations in places where people die. If you feel danger, you are danger-man. When I come to a room and sense something strange and terrible for me, I just turn and show my back. It’s normal, it’s only your fantasy – your emotion and reality. The confines of the self are not the only depths Alexey traverses. – I am good free-diver. Last year in Turkish Straits; forty-five metres free dive with only goggles. No problem. I like to train my body for real function – the purpose must be reality use, not exercise for the sake of it. Practical. The impressive lung capacity required for such a feat is the result of many years of certain breathing exercises – a hugely potent tool to alter both one’s physicality and consciousness, and a phenomena only recently being examined by academia. While the scholarly might lag behind, many of these techniques have been known through numerous ancient wisdom teachings for millennia. – Breathe in from nose and out from lips, and you massage your lungs. Inhale, hold breath, push down diaphragm and afterwards; vacuum. Push and vacuum. When pushing, blood pressure rises. You sit controlling your body, it’s good. Close your eyes and see sun-energy, like golden sand. And when you stop push, left inside you is gold. Having mastered the basics of oxygenation-oriented breathing techniques, such as hyperventilating followed by holding one’s breath, it’s common to receive visual effects behind shut eyes. What I presume Alexey means to say is that having achieved this phenomena signifies some manner of celestial acquisition. Alexey points down towards his forehead with one hand and upwards along the nose with the other, fingers meeting at the third eye. He gesticulates to show that one’s ambition should be drawing air into the centre from above as well as below. Coordination between flesh and mind. – … and this together. Stop, concentrate – look inside your mind, and receive your vision. Then start again. What he describes is very similar to a breathing exercise explored at length in the Ajna Offensive article in Bardo Methodology #1. As Tyler Davis discovered, successful execution will often result in a temporary consciousness blackout. I’m curious if Alexey knows what I’m referring to. – Yes, it’s good. Brain is computer, like operating system. Work, work, work. Hold breath until computer stop – great practice. Your body still works; it connects with unreality world and receives information from space, from another existence. Computer works only with our reality, so when it stops then this existence goes out. But other information flows up your spine, in your fingers, through your skin. It’s good. Sometimes, turn off. As Davis was also made aware, on the other side of the black hole one is often greeted by sensations ranging from confused discomfort to outright terror. – With mind severed from this reality, your body loses control. Like slave suddenly without master; first hour, panic! Where is my boss? Ahh, I’m free! Same situation. Terrible fear is good emotion for the transfer, for the tantra … it’s okay, it’s good. Without fear, without terrible – no real work, only talk and fantasy. While their throat chanting certainly sounds utterly inhuman, Alexey explains that the technique is not an esoteric practice in itself. – Throat sing is not magic, it’s only an instrument like good-quality guitar. Open throat, expel breath and when airway meets lips we have a wave. It’s basic for sound. Practice this voice, no imitation – practice. It’s best way. You never get sick in cold weather, it’s good. When you vibrate in your body, body feel good. Reverberation. For woman, super best. While the technique might not have metaphysical properties in and of itself, it is an efficient tool for establishing a connection to the numinous. As such, I’m curious if it’s really safe to practice alone without guidance. – We are not child, we have mind and experience from our body. If you practice and feel it’s no good, stop. No rules – create for yourself individual exercises with breath. Because we are free, absolutely. What is danger for people? I think death, yes? Death is danger, but in the special station it waits for everyone. We will all die and if death is already expecting us, what then do we fear? – I do not believe, I know. Reincarnation is true. When you die, your mind goes bardo. Normal guys; ’Argh!’, but Bardo Thödol knows the way. The Bardo Thödol, or the Tibetan Book of the Dead as it’s known in the West, is a 14th century sacred text that enlightens the reader on what to expect following death. What is essentially a roadmap through the bardo, an interval state between death and reincarnation, explains what the surroundings are and how to navigate them. After finding the bardo depiction similar to a strong LSD trip, 60s counterculture icons and Harvard University researchers Timothy Leary, Ralph Metzner and Richard Alpert largely based their instructional book The Psychedelic Experience on this ancient codex. – Reading Bardo Thödol to fresh corpse will guide his way through the other side. When men die, they can still hear. Dead man connects with monk who reads text for him. ‘Left, right’… ‘You’re looking at this, not worry – like safari.’ It’s good, law after death. But for me, next life is not interesting for contemporary situation. I don’t think about it, it’s only future and any future can be changed. I’m curious how the past year has treated PHURPA, given their busy tour schedule. Alexey explains that while he despises performing in clubs with open bars, they accept all invitations. – Some guys send me mail, ’Alexey, come with PHURPA’ – okay, no problem. You want, we’re ready. Next position we go on stage and … power. I like loud sound and I like atmospheric space. From where I sit singing, how much or less audience makes no matter. But I’m happy because after performance, people of different ages speak to me. Like yesterday in Italy, gentleman come with respect; ’Alexey, it was fantastic!’ I’m glad. This conversation took place on April 16, the day before the cloaked trio were set to perform in Stockholm two nights in a row. Seeing as they have garnered quite the touring resume, I’d be interested to know the highlights. 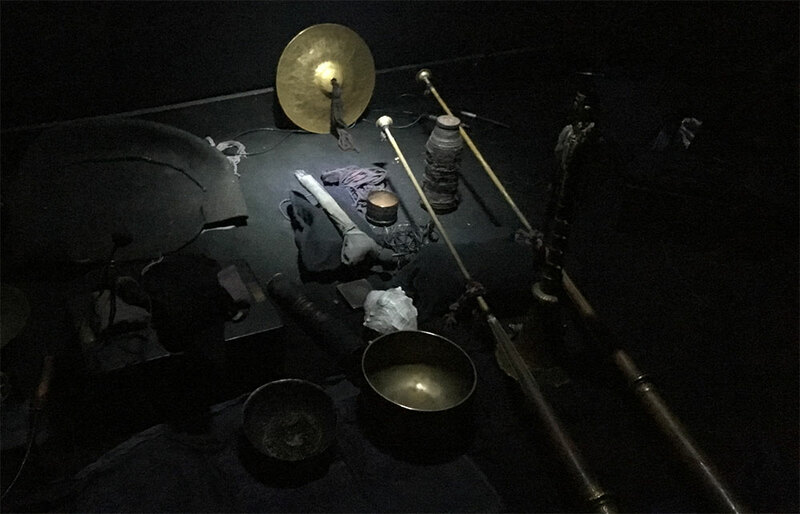 – Some performances with Stephen O’Malley (SUNN O)))) were interesting … Bristol, in the crypt, very atmospheric. I liked the mushroom bunker, and one stage with SWANS. Good performance in Reykjavik, Iceland – the best, atmospheric country. In a somewhat different setting, this summer PHURPA will be appearing at a massive music festival in Spain called Primavera Sound. – I’m like, boy, I must create loud and vibrating low frequency – very powerful sound. People will vomit, total discomfort. You’ve played in a few churches now, is there any difference from performing in other venues? – I’m not religion man – for me, church or meat market is the same. I look to energy and acoustics, not the building. For me its energy situation, I feel it. Some churches are dead space. Underground car parking is for me the best but we never choose venue – invite, and we will sing. I made a valiant attempt at discussing PHURPA’s brand new double-album release, ”Gyer Ro”, but from what I could discern from Alexey’s confusion, he’s not entirely aware of its existence. As it turns out, he has very little insight in the myriad of releases from various labels. – I get emails from many guys, ’I have label, give me track.’ ’Okay! What do you want? Here, please, without money. Thank you, thank you. Next!’ I don’t remember our releases, which sounds are where. For me, it’s life process. I hear from record label, it’s fantastic – I prepare. Like life. CORPS, also same situation. CORPS is Alexey’s industrial side-project, in which he exclusively uses instruments built from scrap metal. The band’s thematic concept is based on a post-apocalyptic scenario where a third world war has wiped out civilisation, and with it all knowledge of music. The survivors reinvent it by experimenting with makeshift instruments from whatever material is available. 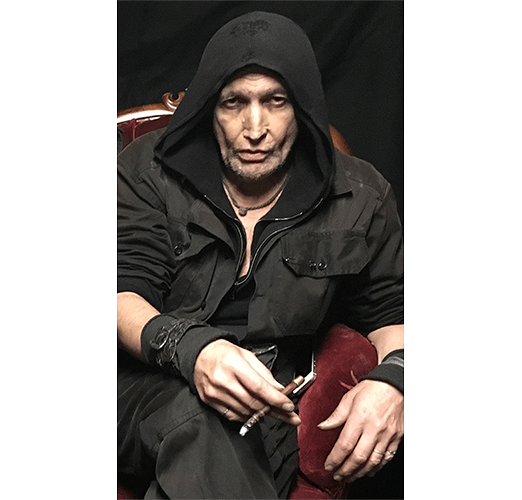 – For me, it’s contemporary metal shamanistic rituals. In autumn, perhaps October or November, I will come here and perform. I decide this. Maybe train to Saint Petersburg and ferry to Stockholm. Alexey’s stage attire with CORPS is a far cry from that of PHURPA, he performs wearing a gas mask and a rubber hazmat-suit. It can’t help but think how it must get pretty bloody hot in there after a while. – Some minutes from start, I am total wet and see nothing. Total discomfort for me, but for the music it’s the best. I’m like other world. Create discomfort situation, create music. This is highly spontanic. What does the future hold for PHURPA? – I don’t know about future, it is nothing. Future is an illusion, the past is just memory. Reality does not exist, remember that.